Properties in Glandon average 4.7 out of 5 stars. For couples, peaceful, pool, near lake beach, chateaux, caves, gardens, markets. Property 1: For couples, peaceful, pool, near lake beach, chateaux, caves, gardens, markets. Property 29: Beautiful barn conversion with private courtyard and pool. Property 36: A former farm house, spacious and without nextdoor neighbours. Property 40: Romantic cottage in historic spot with magnificent view. Artistically decorated detached gite on beautiful historic country estate. Property 42: Artistically decorated detached gite on beautiful historic country estate. 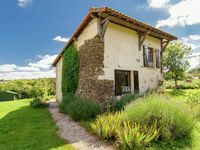 Property 45: Authentic farmhouse with heated pool close to a river on a beautiful spot. Property 46: Luxury cottage with stunning views of valley with castles. Luxury villa with heated private pool and beautiful view. Property 47: Luxury villa with heated private pool and beautiful view. Property 48: Farm and separate guest house with beautiful views of the valley. We (parents with two kids (5y)) had a very nice holiday. The house was not big, but big enough for four. The garden is huge. Very hot weather, lots of tranquility, beautiful scenery. We swam in the lake Roufiac, visited castles. Nearby there is also Les forges with waterfalls where you can paddle, ... A little further are the caves of Lascaux. You do have your car still needed, but the distances are not so bad. Price - quality very OK!